. For partners, you won’t see this just yet. Currently, this option is only available for YouTube account holders with Google+ profiles, which represent individuals, and not for Google+ pages, which represent brands, businesses, and organizations. Once we have the bits ready, you’ll be able to connect a Google+ page to your YouTube channel. If you prefer to use the really awesome personal Google+ profile that you already set up on your channel, we’ll soon allow that for partners as well. Just be aware of the extra functionality pages have (above) that is not available for profiles. Ok, I get it. What should I do now? After we enable partners to use a Google+ page on their channel, we plan to develop more innovative engagement features, like Hangouts on Air, that take advantage of the strengths of both YouTube and Google+. 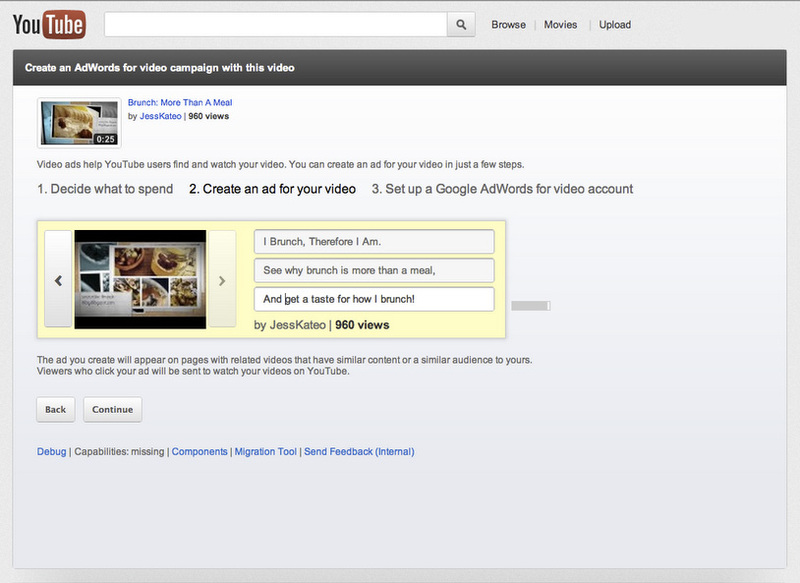 Stay tuned, and we’ll let you know about more opportunities that allow you to use Google+ and YouTube together soon. David Boyle, YouTube staff, recently watched Beauty and the BEAT! You may have seen that we’re allowing the use of one Google-wide identity on YouTube channels. For partners, you won’t see this just yet. Currently, this option is only available for YouTube account holders with Google+ profiles, which represent individuals, and not for Google+ pages, which represent brands, businesses, and organizations. 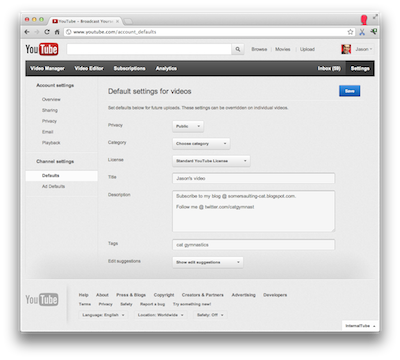 page to your Channel Settings that allows you to set default information for future uploads. Simply choose your Channel defaults, press Save, and they will show up on future uploads. Of course you can always override these defaults on individual videos. To give it a try, visit youtube.com/account_defaults. And as always, we’d love to hear what you think. Ben Bernard, Software Engineer, recently watched "Doodling in Math: Spirals, Fibonacci, and Being a Plant." If you’re a frequent uploader, you’re probably used to typing the same tags and choosing the same category for videos again and again and again. As important as finger exercises are, we thought we could make this easier -- so we’ve added a Defaults page to your Channel Settings that allows you to set default information for future uploads.
. Starting today, you can go to youtube.com/dashboard to check it out and get a quick snapshot of your channel’s recent performance. With the Creator Dashboard, you’ll see recent uploads, recent comments on your videos, account notifications, high level stats, and announcements about new features. In the future, we hope to include additional information to help you better manage your channel. To that end, if you have ideas for how to improve the Dashboard, email us at db-feedback@youtube.com. And for more details on the Creator Dashboard, check out our Help Center. If you’re a frequent uploader, you’re probably used to jumping around YouTube to access the right tools and information you need to understand your channel’s performance and make changes to improve it. To help you more quickly access this data and more easily make channel optimizations, we’ve just launched the YouTube Creator Dashboard. Starting today, you can go to youtube.com/dashboard to check it out and get a quick snapshot of your channel’s recent performance. the ability to crowdsource funds for creative projects with video annotations linking to Kickstarter and Indiegogo. Now we want to help you fundraise and raise awareness for causes you care about by teaming up with Causes, Change.org, RocketHub and DonorsChoose.org. You can now add annotations to your videos that send viewers directly to projects on these sites, which all use the power of crowds to create social change. We’ve already seen some great YouTube creators do their part to give back. For example, the VlogBrothers (John and Hank Green) organize the YouTube community to upload videos and fundraise for their favorite causes every December. This event has become known as Project for Awesome because so many people participated that the videos actually took over the YouTube homepage in a "flurry of awesomeness." And YouTube comedian Kevin Wu, aka KevJumba, has been using YouTube to raise awareness and donating 100% of his Jumbafund channel’s ad revenue to build a school in Kenya with The Supply, a non-profit supporting education. We hope annotations help you support the causes you care about, from encouraging services for veterans to helping Kenyan youth preserve wildlife to teaching students about electricity to ending seal slaughter. To use the feature, go to your Video Manager, select a video, click “Edit” and select Annotations. You’ll see the following screen, with an option to link to one of these sites. You can find more information on annotations in our help center. The YouTube for Good team is always looking for ways to turn video views into action -- like dollars donated, petitions signed, and laws changed. So today, we’re excited to announce a new way to use your videos to spur action and give back. In April, we announced the ability to crowdsource funds for creative projects with video annotations linking to Kickstarter and Indiegogo. Now we want to help you fundraise and raise awareness for causes you care about by teaming up with Causes, Change.org, RocketHub and DonorsChoose.org. You can now add annotations to your videos that send viewers directly to projects on these sites, which all use the power of crowds to create social change. as YouTube’s featured “On The Rise” non-profit partner for June! Thanks to your support and the strength of of their channel optimization, this organization is featured in the “Spotlight” section of our homepage today. The World Food Programme has been in existence since 1963, when it was established as a multilateral food aid program by the Food and Agricultural Organization Conference and the United Nations. Over the last 40+ years, the organization has worked tirelessly to fight hunger and poverty globally, with the ultimate goal of eliminating the need for food aid. Their channel features a variety of video content that describes the magnitude of the global hunger problem, highlights specific issues and emergencies, demonstrates the impact of the WPF’s initiatives, and identifies opportunities for supporters to take action to assist the organization’s mission. Thanks to everyone who voted for us, and especially to YouTube, for this incredibly cool opportunity. At the World Food Programme, we believe that hunger is the world's greatest solvable problem. It affects nearly a billion people worldwide and yet we have the means to solve it. WFP is the world's largest humanitarian aid agency on the front lines of hunger. When we're not saving lives in emergencies, we're helping families get back on their feet. When we're not serving meals in schools, we're protecting mothers and children from malnutrition. Subscribe to our YouTube channel and find out what it's like to drive across the Sahara, ride a yak through the Himalayas or fly a helicopter in South Sudan as we deliver food assistance to some of the most dangerous and remote places on Earth. We’ll see you there. You can learn more about YouTube's nonprofit program and the 17,000 organizations in the program here. If you’ve enjoyed this monthly On The Rise blog series and want to see more rising YouTube partners, check out our On The Rise Channel. Keep an eye out for next month’s blog post, as your channel may be the next one On The Rise! Please join us in congratulating WorldFoodProgram as YouTube’s featured “On The Rise” non-profit partner for June! Thanks to your support and the strength of of their channel optimization, this organization is featured in the “Spotlight” section of our homepage today. 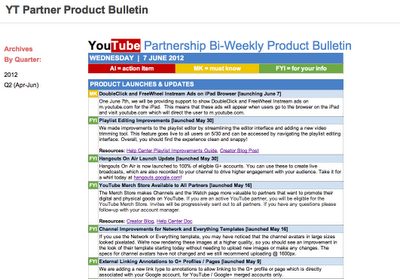 Learn About the Latest Product Changes on the Product Bulletin! Check out our latest editions on the Product Bulletin Site here. We hope you find the information useful and are looking forward to bringing you more updates every other week. You’ve told us that you want to know what is changing with YouTube and its features. 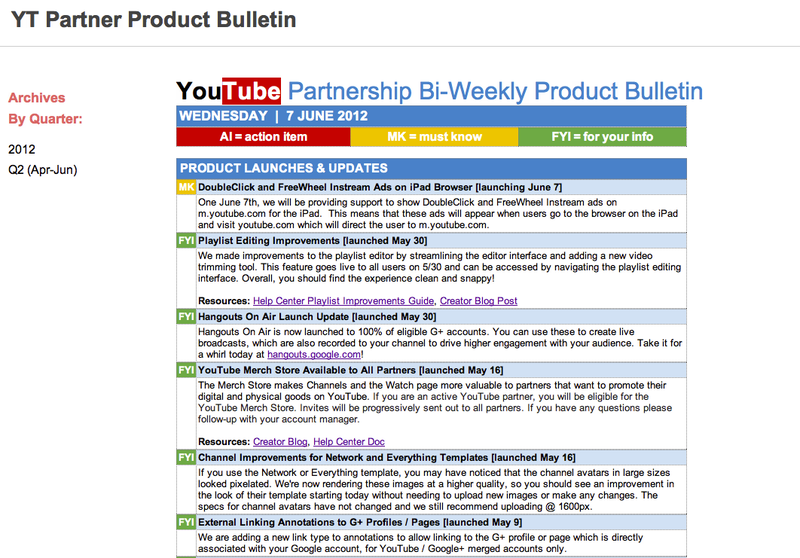 To keep you in the loop, we’ll now distribute bi-weekly product bulletins. Product bulletins give you short snippets of all the latest changes to our products and are color coded, so that you can quickly skim and find information. workout channel, he built a growing subscriber base but felt that he was only reaching a portion of people interested in fitness content on YouTube. He tried out YouTube video ads, and now 41 percent of new viewers find him through his ads and his subscriber base is more than 460,000 strong. We realize that there may be other creators who also want to reach more people with their videos. So to make it easier to reach a larger audience on YouTube, we’ve developed a new way to create an ad for your video directly from your video manager. With this new feature, you can now easily upload a video to YouTube and start promoting it with a video ad within minutes. Starting today, you can access this tool by selecting the "promote" link on the video manager "edit" drop down menu, or from the watch page dashboard drop down menu. Enter the amount you want to spend and you can use the traffic calculator to estimate how many views to expect from your ad campaign. You can then target your ad to reach a specific audience and write three lines of text that will appear next to your video ad. 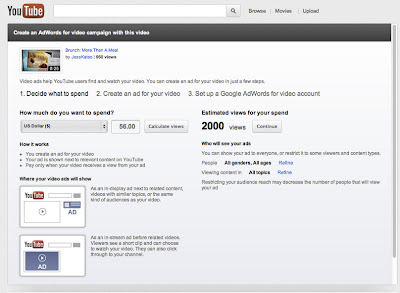 To complete your ad, simply set up your billing profile in Google AdWords for video and confirm your settings. If you are an existing AdWords advertiser, you will not need to create a new account, but if you’re new to AdWords, you will create an AdWords for video account as part of this set-up flow. By default, your ads will appear as TrueView in-display ads on YouTube pages with related content and TrueView in-stream ads before related videos. As with all TrueView video ads you only pay when a viewer watches your ad. If you’d like to try other formats or targeting options, you can make these changes in AdWords for video at any time. New AdWords users can receive a $75 credit toward ad campaigns - request your free credit here. 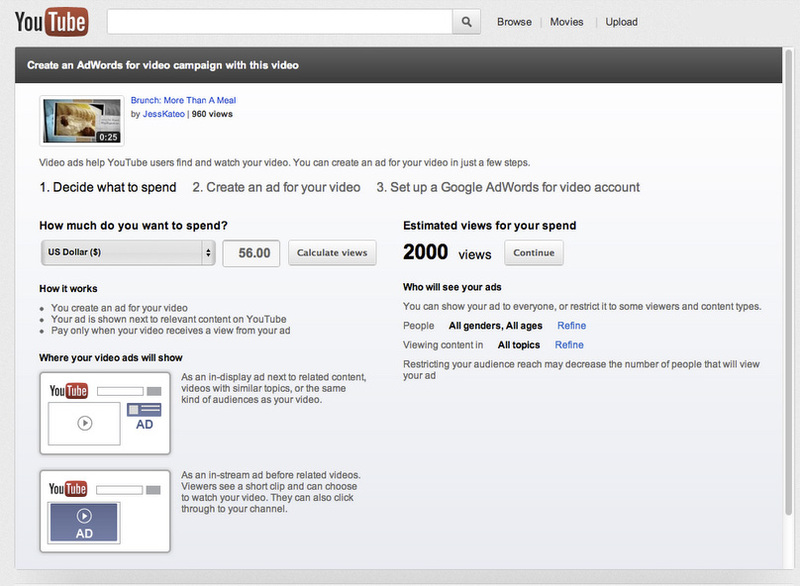 More information on creating your first video ad can be found in our Help Center. This is the latest example of how we’re enabling you to reach more potential viewers and grow an engaged audience on YouTube. In March, we also announced YouTube Partner Promotion, which automatically pulls from your top content to create promotions that run across YouTube and the Google Display Network with the goal of reaching new subscribers. As always, you can find examples of other resources available to you at the Creator Hub. Like many creators, when fitness instructor Mike Chang first created his workout channel, he built a growing subscriber base but felt that he was only reaching a portion of people interested in fitness content on YouTube. He tried out YouTube video ads, and now 41 percent of new viewers find him through his ads and his subscriber base is more than 460,000 strong. YouTube, musical artists and acts from the established to the experimental can share their talent, find new fans, and sing their hearts out. And we’re committed to making sure their works can reach the widest audience, and that the singers and songwriters will continue to be appropriately compensated for these works that we all love so much.